This is part three of four. Read part one here, and part two here. Jack spent that night on a small table in Sam’s bedroom, next to the clock radio. With his one good eye, he watched the trees outside toss their leaves into the gusting winds. The streetlight shining through the waving branches flung manic shadows across the room. Jack watched the street in silence, Sam’s words running circles in his thoughts: He has a scar over this eye so he can’t open it … he’ll be the scariest jack-o-lantern in the neighborhood … call him One-Eyed Jack … he can’t open it. Jack thought the scraping had been the worst part of being Chosen, but this anticipation was as bad. Tomorrow night was Halloween, and he was to guard Sam and his mother against whatever evil or undead spirits might haunt the neighborhood. But his eyes—or rather, his eye—had only just been opened. Would one eye be good enough? Would he recognize a ghost if he saw one? A demon? Jack didn’t know—but he was all but certain that two eyes would be better than one. And yet, before Sam’s mom had turned off the hall light, Jack had seen his own reflection in the window. Sam had carved a narrow gash below the natural crease, then had stapled across the cut in several places—“like stitches,” he said. The effect did make Jack look uncommonly fierce for a pumpkin—like one who had weathered the winter and emerged hardened, not soft. And the crease was a birthmark of sorts to Jack; he took strength from this sign of his Mother Vine. Something moved in the street. Jack’s wide triangle eye strained into the darkness. A tall, thin figure in black was coming up the street. It moved not unlike Sam, so Jack reasoned it was human—but still he felt uneasy. His steady gaze never left it as it drew nearer. When the figure crossed under the streetlight, Jack saw it was a boy—older than Sam, with spiky yellow hair like a dandelion atop his head. His hands were jammed deep in his pockets as he sauntered past. He glanced once toward the house, and fierce eyes glittered blue above a narrow nose and thin lips. After Sam left, his mother moved Jack to the front step and placed a small, vanilla-scented candle in a glass holder inside him. Jack beamed at the thought of the fire to be lit in his belly at dusk, and spent the day watching the street for Sam to come home. When the bus rumbled to a stop at the end of the street, Sam wasn’t the first to emerge. Instead, Jack saw a stocky, crew-cut boy in jeans and a black t-shirt, and a familiar, lean figure with spiked blond hair and pale eyes that seemed to lock on Jack immediately, then turn away. Sam and his friend Bryce ran to the porch in their pirate garb, and stopped to admire Jack. “Right,” said Bryce, and they went inside for an early supper. That evening was exactly as Jack had imagined. Sam’s mom lit his candle, and he glowed orange in the failing daylight. His grin radiated Halloween cheer to scores of trick-or-treaters—princesses and goblins; ghosts and wizards; vampires, mummies, knights, and superheroes—but his eye was ever watchful, and his gleaming yellow scar earned many wide-eyed looks of admiration. As the evening deepened from violet to purple to black, Jack began to notice other forms among the false ghouls and monsters prowling the neighborhood for candy. These forms moved differently from the children—at times effortlessly; other times, disjointed—and appeared silvery-grey, casting no shadows in the streetlight. The spirits grew bolder as the night drew on, approaching homes behind the children, hoping to pass the threshold when the doors were opened. Jack was vigilant, glaring balefully at any spirit that ventured too close to Sam’s house. Slowly the constant flow of trick-or-treaters diminished, and Sam returned home with a false pumpkin filled with candy. As he approached the house he held out the plastic pumpkin for Jack to see. Sam’s mom let Jack’s candle continue to burn even after Sam turned in. All the lights were off in the house, and she sat in the family room, watching TV. The apparitions hovered high above the houses now, looking for doors left ajar and homes left unprotected. Jack kept his one good eye on these spectral creatures, but his mind wandered. He thought back to the summer, his green and growing days, his ripening, and his worries just two days earlier that he may never be Chosen. Now Halloween was drawing to a close, and his purpose was nearing fulfillment. In the frosty dawn, he would appear shrunken and old; his teeth would fold inward, his facial features soften and wither. He might not last the weekend, but no matter. He need only last the night. A gust of wind sent a swirl of dry leaves across the porch, and Jack’s candle flickered and went out. Vanilla-scented smoke rose slowly from his eye and his scar. Jack heard whispering. He looked up the street to see two boys approaching—one thin, one thick, both dressed head to toe in black. The thin one’s eyes and teeth gleamed as he smiled. He grabbed Jack in both hands, walked to the paved driveway, raised the pumpkin high above his head, and brought him crashing down. There was a sickening crunch as Jack’s shell gave way, followed by the sharper sound of the glass candleholder smashing on the concrete. “Man, let’s go!” shouted the stocky one, and the two boys raced down the street. She stepped back in the house to dress, leaving the front door ajar. Jack was scattered in pieces across the driveway. The Destroyer, he thought. No one to protect them, and hours before dawn. His triangular eye lay flat on the cement, staring up into the void. A silvery figure floated into his field of view, hollow eyes expressionless, but a ghastly toothless grin across its ancient face. A small, thin voice, like the hiss of a cockroach, spoke directly to his mind: Most unfortunate for you, Jack. And the woman left the door open—an open door; an open invite tonight! Tell me: Does young Samuel seem soft to you? Will he scream? Wet himself? Oh, this should be fun! NO! shouted Jack, though he had neither a mouth nor a voice. Stop me, then, Jack, if you can. You’re a broken shell; you have no power over me now. Well, I should be going, the ghost hissed. Go rot, Jack. Enjoy death. 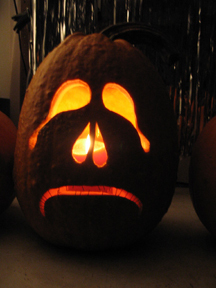 Photo: One of the old man’s jack-o-lanterns, 2007.